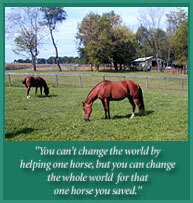 Wild Roseberries, known as Rose, was a 23 year old mare rescued from a riding stable. 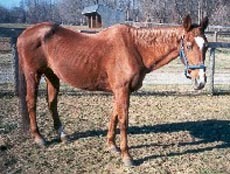 She was not being fed enough and but was forced to continue giving riding lessons, 3 to 5 hours per day, 6 days a week. When she was brought to M.E.R. she had numerous saddle sores from being ridden while so thin. 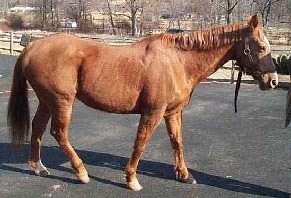 She has since been placed in a wonderful home as a companion for an older gelding.